Anyone ever have this problem and what did you do to resolve the situation? It's not my stand but thought it was interesting anyway. I don't see what all the BUZZ is about, looks like a well padded seat. I would declare WAR with Hornet Spray while wearing heavy clothing! I found out carburetor spray cleaner works a whole lot better than wasp spray. go in at night w/ wasp spray w/ a +20' stream. i had the same issue in my shed. Holy cow, I can just see me climbing into that thing at o'dark thirty and shoving my hand through it. I'm with Yari, although you may want to do something to rip that dude open so the spray can get at the little buggers. If it has a decent opening and you can get the spray into it, that would work, but something tells me that might be a tough target from the ground. 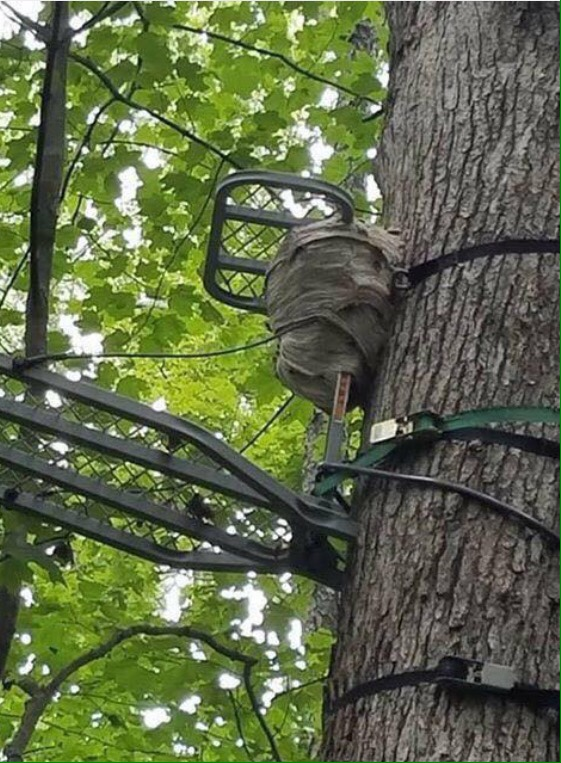 Hornet spray or just buy a new stand I would go with a night time operation heavy clothes and 2 cans of spray. Try from the ground first don't want to fall on top of getting stung. I would let them have it. It would be nice to have a new stand. I second the vote for flame thrower. I hate hornets!!! I would wait til night or early morning when it is still dark and cool the empty a can of horney spray on it soaking it the best I could. Just do not stand under it when doing this.